With the increase in the usage of digital media, security is something which is not supposed to be ignored. But unfortunately, the consumers tend to provide less importance to secure their data or make regular backups that leads to a digital crisis. Norton a leading brand in the security space has come up with an all in one solution for the consumers. With the launch of its new Norton Security Solution which works on a subscription basis and is priced according to the number of devices, they plan to make the things much simpler. One of the most recent trending threats amongst the consumer is Ransomware – which is a malware that locks down all your files by encrypting it and the only workaround is to pay the ransom in exchange for the key. According to Symantec’s latest Internet Security Threat Report, Symantec discovered more than 430 million new unique pieces of malware in 2015, up 36 percent from the year before and in August 2016 alone, there were 45 million new malware variants, the highest level seen since August 2015. The exponential growth in the number of new malware is an alarming thing. Speaking about the new Norton Security Solution, it works on multiple platforms viz. Windows, Mac, Android and iOS. You just need to have one common subscription which will work on every platform. There are three different plans available Standard, Deluxe and Premium. You can always shift from one machine to another with the same license according to your subscription plan. Making everything standard and available in one package makes Norton Security much simpler. No more confusions between Antivirus, Internet security or any other product variation. Zero-day attacks are the ones which even the software vendors are unaware of. Patching such loopholes in the software can take months. With the proactive exploit prevention, Norton recognizes the standard behavior of the Zero-day attacks to prevent losses till the software patch arrives. Malware, viruses are often hidden inside innocuous looking files that will affect your system when you run them. But with Norton Security these files are first tested in a virtual emulated environment for any threats to prevent the attack from spreading into the operating system. Learning is a process that never stops or rather it should not. Once the signatures of the existing malware are detected, the new malware will have something different. With machine learning, Norton Security anticipates the new signatures of unknown malware to detect and block them. There are certain vulnerabilities in the MAC OS too which surfaced recently and Norton is also providing security for it. With the new update, the resource utilization for the scanning will be low which will not affect the working of regular applications. My Norton is an all-in-one web portal to manage accounts, subscriptions, parental controls etc. One can manage multiple devices on the same portal and they also have smart alert system for new threats that are discovered continuously. 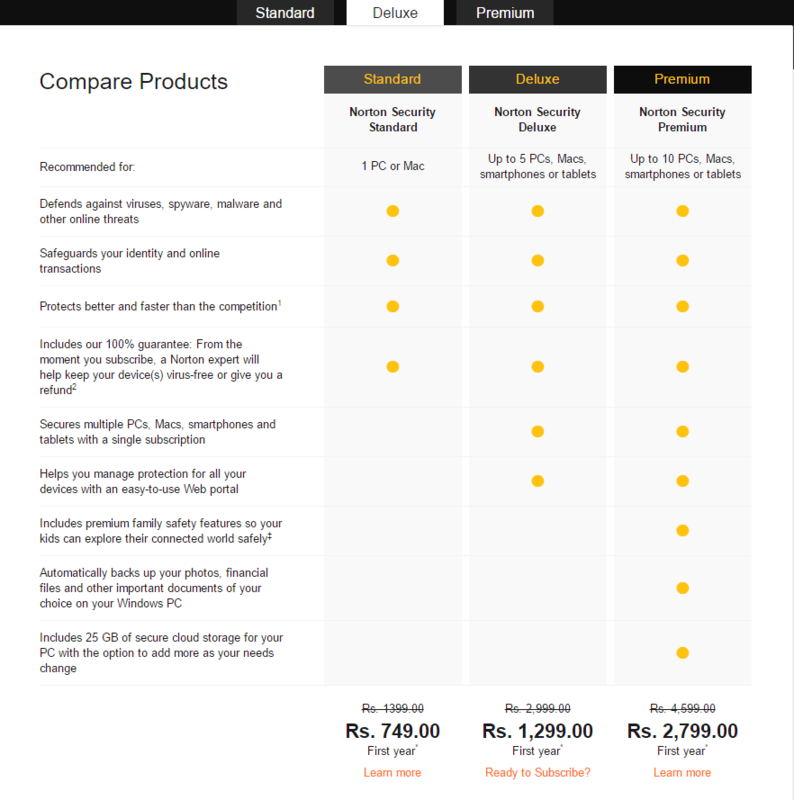 The pricing of Norton Security starts at Rs. 1,399 with periodic offers. Currently, you can buy the Standard pack of Norton Security for Rs. 749 for the first year. All the packs and pricing information is available at in.norton.com and the pricing information includes credit/debit cards, Net banking for 40+ national and regional banks. Consumers should really start focusing on their security as the dependency on digital media is increasing and the data is now the most important thing to any person. Keeping your software updated with a good antivirus solution is currently the best preventive measure for you to avoid getting hit by attacks. Norton Security solution is something that I can surely recommend using. Which antivirus program you prefer, mention it in the comment section below.